Elender Culpepper married William Stewart on 9 Feb 1830 in Wilcox Co., Alabama. J. John F. Pate b. 3 Feb 1865, d. 20 Sep 1936, md. Martha A. Brown. John F. Jr. was in Scurry Co., TX by 1900. E-mail written 2000 to Lew Griffin from Jinks Pate Lee, e-mail address. Lemuel Culpepper, 1 M16-26, 1 F0-10, 1 F16-26, 1 slave. Erasmus Culpepper (Jr), 1 M0-5, 1 M5-10, 1 M30-40, 2 F5-10, 2 F10-15, 1 F40-50, 22 slaves. Harriet Culpepper married John F. Pate on 7 Aug 1838 in Wilcox Co., Alabama. Abel & Lucy Ann Davis were 1st cousins. I [Jan Selleck] met many of the descendants of E.B. Davis and Leila Culpepper Davis at the 2000 homecoming. I can continue their lines, but most are still living. Again, all of the DAVIS families are extended in Mary K. Reynolds' book, Ancestors and Kin. Mary Culpepper married Johnson Davis on 4 Jun 1841 in Wilcox Co., Alabama. I [Jan Selleck] am keeping the DAVIS families brief. Ancestors and Kin by Mary Kennedy Reynolds continues all the Davis lines in great detail. Martha Culpepper married Clark Allen on 3 Oct 1841 in Wilcox Co., Alabama. E-mail written 21 May 2012 to Warren Culpepper from Phylis Ann Bailey (3gtgd/o #9727), e-mail address. 1840 Census 1 Jun 1840� Lemuel was probably a free white male, age 5 and under 10,in Benjamin Culpepper's household, on the 1840 Census on 1 Jun 1840 at Wilcox Co., Alabama. Copied from Microfilm 320 Roll 112. 3) Laura Ann Cook b. 1849. 1. Thomas Alphono Davis, b. 8-10-1887 AL, d. 8-17-1889, bur Lower Peach Tree Cem. 3. Ernest Culpepper Davis, b. 11-1-1894 FL, d. 3-10-1902 AL , bur Lower Peach Tree Cem. Leila Culpepper married Ethelbert B. Davis on 14 Oct 1886. + Leila I. Culpepper Davis, 1865 - 1935. Biography* � Caroline Octavia Culpepper married James Joseph Overton, a cousin. He was the son of John Overton and Lucy V. Southall. Her father was Dr. James A. Southall, a brother to John Southall. I have letters written by Octavia to Jimmy Overton before they were married. Evidently he was concerned that he wasn't good enough for her, as he wasn't wealthy, but her letters were full of love and reassurance. They married in the Methodist Church in Lower Peach Tree and two of their baby boys are buried at the Lower Peach Tree Cem. They moved to Prichard, near Mobile, Alabama in early 1900. 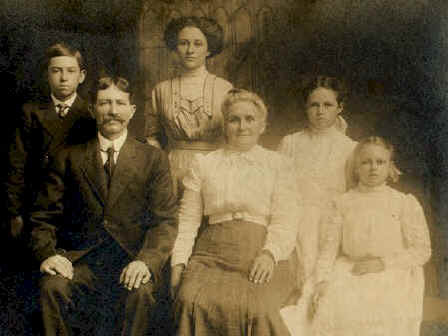 Their children were Janie Adele, Alonzo, Lillian, and Connie. Alonzo "Uncle Lonnie" married Ida Herndon and lived in Prichard. "Aunt Lillian" never married but was a schoolteacher in the Mobile area for many years. 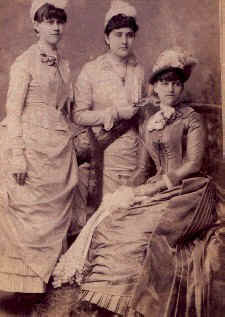 Connie married at the age of 18 to Walter Dickinson and died a year later in childbirth. Janie Overton and J.G. McCoy met and married near Mobile, AL and had four children. 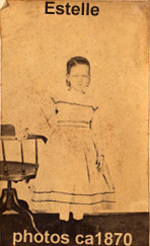 Janie or her sister, "Aunt Lillian" would take the children on the train from Mobile to Sunny South where Aunt Leila Davis or someone would meet them in a wagon drawn by mules. This would have been in the mid- or late-1920s but those trips to the country were well remembered. 3. John Overton, b. 4-8-1895 LPT, d. 10-1-1896 LPT, bur. LPT Cem. 6. Connie Overton, b. 6-17-1901 Mobile, AL, d. 8-31-1819 Mobile, AL, bur. Whistler Cem., m. Walter Dickinson. Connie and baby died in childbirth. Octavia Culpepper married James L. Overton on 8 Oct 1891 in Wilcox Co., Alabama. Essie Culpepper married Ed Peppers on 10 Nov 1885 in Wilcox Co., Alabama. 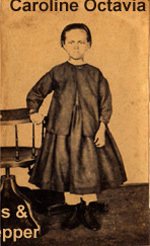 Biography* � Leila Isabel Culpepper was the youngest daughter of Erasmus and Rebecca J. Culpepper. She married Ethelbert Brantley Davis, a cousin, his parents being Johnson Davis and Mary H. Culpepper. E.B. Davis helped with the Culpepper farm as well as with the store. Later he became a partner and managed the Culpepper-Davis store in Lower Peach Tree. E.B. 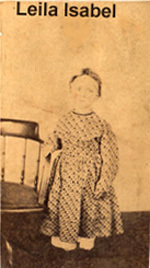 and Leila were blessed with six children: Ernest Culpepper and Thomas who died at an early age, Eula Octavia, Mattie Estelle, Mary Rebecca, and Ethelbert Brantley, Jr. Eula Octavia married William Grover Kennedy of Nettleboro, AL and died soon after their first child, Ethelbert, was born. Mattie Estelle married Clarence Eugene Garrick of Scyrene, AL and they lived in Lower Peach Tree. Mary Rebecca married David C. Morris of Nettleboro and they always lived in Akron, Ohio. E.B. Davis, Jr., married Lula Rea Pharr of Catherine, AL and lived in Wilcox County all of his life. E.B. Davis, Sr. died in 1912 and Leila lived many years after this at her childhood home near Lower Peach Tree. Over the years, the old Culpepper place became the old Davis place. It was a home welcome to all and Leila was known for her love for people and her love of travel. We believe that she is the first woman in LPT to own a car, even though she never drove it! Her willing chauffeur was Ethelbert Kennedy, a beloved grandson whom she raised. Demaris Morris Walker remembers visiting her grandmother's house and recalls memories such as outhouses, separate kitchens, kerosene lamps, dark shadowy rooms, wells, and cold biscuit lunches! Glendine Garrick Collier walked to her grandmother's house quite often. She recalls many overnight stays and sleeping on "featherbeds", luxurious mattresses filled with down which her grandmother and others had plucked from the geese on the plantation. She had the joy of playing with many of the toys, paper dolls, and games stored in the Culpepper trunks. Sampling blackberry nectar was a treat, too. E-mail written 2001 to Lew Griffin from Renee Richmond (great granddaughter of Leila Isabel Culpepper Davis). 12 Mar 1922, page 10, Wedding Annoucement of Mr. Sampson M. Culpepper of Louisville, GA and Miss Reba Edith Burke (d/o of M/M W. E. Burke of Millen, GA), 3 Mar 1922, Wrens, Jefferson Co., GA.
"Nathan W. Culpepper and Sarah Ann E. French on Feb 18, 1851 in Marion Co., GA."
Sarah Culpepper, 30, F, GA.
Sarah Culpepper, 43, F, GA. Biography* � "After their marriage they [Joe Ben and Bertha Jane] lived and farmed around Calloway County, Ky. Tobacco was their main crop, but they also raised corn and some cotton. Of course they had cows, chickens and pigs, as most all farmers did in those days. "When Tommie was a little boy, a most tragic event took place - their home burned to the ground. It was in the middle of the night so all they escaped with was their night clothes they were wearing. He remembers so well he had just been given a pair of red boots and was so proud of them; of course they never were replaced. All their belongings were a total loss. "They did move to Murray for a year after which their father built another home at the same location. "The older boys worked on their farm or for other farmers in the area when they were growing up. Tommie says he worked on his Uncle Perry Thornton's Dairy Farm one summer for $3.50 a week plus room and board. "It is hard for Tommie and Norman to remember much about their older sister, Ola, as they were very young when she left home and was married, at about the age of 19. They do remember she was very kind and sweet. Both Harty and Tip also left home after high school and made their home in Detroit. "They prospered the first year, wearing out their truck. Then buying another in 1940. Being their folks were now living in a big home near the grocery store; both the boys lived at home. By this time Norman was married. They had a little apartment on one side of the home. This was very convenient for the boys as they were up early in the morning and worked late at night. "One of the boys would stay in the store and the other would go out on the road selling groceries and buying in return eggs, cream, butter and even chickens. "All this would have to be unloaded at night and taken into Murray and then the truck would have to be loaded with the groceries for the next day. It was a profitable business and they did very well up until World War II. Both Norman and Tommie were called up to service and the store had to be closed and the truck sold. Tip Culpepper, Son, M, 6, Sng, KY/KY/KY. T. B. Culpepper, Son, M, 2 1/12, Sng, KY/KY/KY.